A short hour long flight from Tahiti will take you to one of the most pristine, untouched, and stunning islands on the planet. Located in the Tuamotu archipelago, the island of Tikehau is a classic atoll that is famous for its incredible pink sand beaches and sparkling turquoise lagoon. 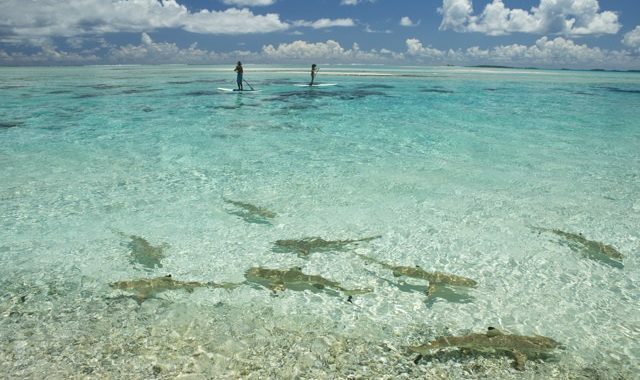 Coming from the Tuamotu language meaning “peaceful landing”, Tikehau is a popular vacation destination for Polynesian locals, and a staff favorite island due to its crystal clear waters that are teeming with fish, serene environment for relaxing and rejuvenating, and peaceful atmosphere. Tikehau is the perfect island destination choice for the traveler who enjoys a unique setting (since not just any beach will have gorgeous pink sands), a great place to stargaze, and a more naturalistic, rustic feel. Tikehau is the perfect place to experience the tropical outdoors and appreciate natural beauty as you have never seen it. Since Tikehau is said to have the most varies species of fish in all of French Polynesia, it is unsurprising that popular activities on this island paradise include world class scuba diving and incredible snorkeling. The wide array of tropical fish, especially clera water, and bath-like water temperatures real make this island a snorkeler’s paradise. Not a strong swimmer? Not to worry! The water is so clear that you can see the fish swimming beneath the sea from the shores! Tikehau’s incredible biodiversity also extends beyond the seas. In fact, visitors enjoy excursions to the nearby Bird Island motu to see the exotic, stunning, and surprisingly friendly birds that include the Red Footed Booby, Frigate, and Egret. On Tikehau, you can either stay at the Tikehau Pearl Beach Resort or the Ninamu Resort. Both of these resorts are designed with natural materials and an emphasis on the beauty of the natural environment. While staying in an overwater bungalow is a uniquely Polynesian experience, we really recommend staying in a Beach Bungalow while on Tikehau. There is something indescribably magical about waking up on a pink sand beach. When planning your next vacation to French Polynesia, we strongly recommend spending at least a few days in Tikehau. Its simplicity, beauty, and majestic shores will give you the perfect opportunity to enjoy those you traveled with and leave you with memories to last a lifetime.